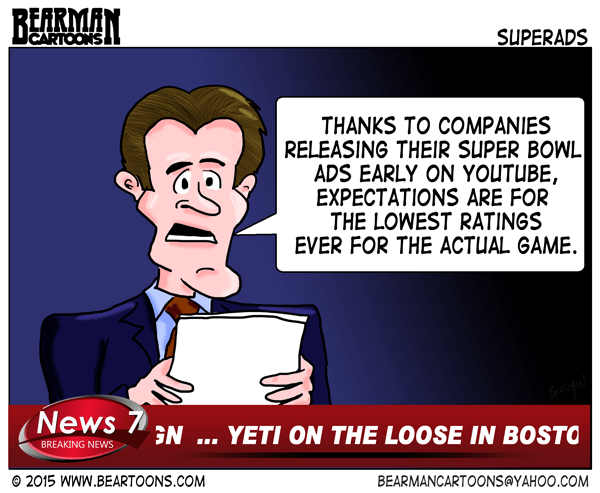 Super Bowl Ratings Decline. That is the headlines I predict on Monday. How many people have gone to a Super Bowl game and when the play stops and the commercials start, everyone is told to quiet down so people can hear the TV. Companies spend millions of dollars both on the ad time and the production of a 30-second Super Bowl spot. And Snickers released their Brady Bunch ad with Danny Trejo and Steve Buscemi yesterday which already topped 1 million views. So are you planning on watching? Do you watch for the game or the ads? If there I nothing then why even investigate? Why not say there is no regulation regarding amount of air? If you can change the topic of discussion from domestic abuse running rampant within the league, to Tom Brady’s perfect, yet deflated balls, which one would you sit back and fan the flames with? At was a PR touchdown to let a non issue become a BIG issue. [wink] Meanwhile, somewhere, a football player is beating his wife, or girlfriend in yet another elevator, but Toms pigskin, perfect feeling balls are the headline. I’m watching this year mostly for the beer and appetizers. I never watch for the ads and get tired of the people who talk during the game (ignore the game) and then tell me to be quiet for some commercial. I watch a whole season of football to watch football. It will be on in my house but I will not be watching. Usually, we Canadians don’t get to see those great ads until after the fact due to our CRTC substitution regulations. That means that we watch the same program but our Canadian ads are substituted in. This will be the first year that the CRTC has allowed us to view them as the Americans do. Thanks to the releases on the internet I’ve already seen them anyway. You just can’t beat the Budweiser commercials. This one is as good as they get. Love it. I’m not watching the game so it doesn’t matter to me one way or another, but I agree that when I did watch the commercials were a very anticipated treat. Loved the Snickers ad. And what happened to the Yeti in Boston??? Woo hoo, you spelled it right! Except that any American readers would say I spelt criticised/criticized wrong. I watch for the great ads but occasionally the game is good too. Over the years I rate the games as good about half the time. Oh, I predict there will be many camera shots of the pile/sack of footballs on the sidelines. I think your prediction was correct. Whoa whoa whoa. There’s a _game_ that goes with the ads? No, way, dude! These guys are geniuses! What will the young people come up with next! I _love_ their energy! I know…what will they think of next. Pizza delivery during the game? I actually plan on watching it this year because my team, the one that everyone loves to hate, is in it. I have never paid attention to any of the commercials during the Super Bowl. I always wait until the day after to watch them in the normal swing of things. I’m sorry, was there something going on between the ads? I believe the Super Bowl is one big ad for the NFL. Guilty of watching all the commercials early on YouTube. I have an excuse though …. We don’t get the ads during the game . What do you get? Propaganda?